Long distance swimmer Matt Moseley struggles in the midst of what he calls, “the hardest and longest swim of my life.” It also brought an early end to his 50-mile Caribbean crossing attempt. After 15 hours of massive swells, headwinds, and an ever-decreasing pace, Moseley and crew stepped foot on Culebrita, Puerto Rico (miles from their hopeful destination, Vieques). After completing a flawless first leg of his 50-mile Bahama crossing attempt (a four-mile jaunt from St. John’s to St. Thomas) Matt Moseley ran into trouble. At 3:40 AM, three hours later than was planned, his support kayak and dinghy pulled away from the catamaran and battled against waves before dropping him on the shore of St. Thomas. Moseley soon left the beach and began what he would become the hardest swim of his life. Somewhere in the dark, behind the leading catamaran, bobbed the LED-lit kayak with Moseley alongside. 20 mph gusts blew Mark Williams, his mental coach in the kayak, one direction while the current and six foot waves pushed Moseley in another, making it especially hard to stay close together. Williams radioed over to Randy Soler, his swim coach and PR manager of the operation: “The swells are really big out here, so if I capsize, you guys need to be closer.” A swimmer separated from his kayaker in the middle of the night in the middle of the sea could be fatal. The catamaran couldn’t cruise alongside as it had the day before because the conditions would cause the catamaran to displace water that would interfere with Moseley’s progress. “Got it,” Soler responded, “Make sure the shark deterrent is turned on,” referring to the crucial machine that released ultrasound waves to, hopefully, keep the predators at bay. Every 25 minutes, Soler radioed over Moseley’s “feeding” menu. While Moseley watched the bioluminescent dinoflagellates as his strokes disturbed the water, Williams alternated between discreetly puking over the side of the kayak and searching the cooler to identify the labeled meals he would then place in the feeding net for Moseley. When dawn broke, the intensity of the swells became visually more obvious to those on the boat. “You want a surf board?” Soler radioed over to Williams. “No, but I’ll take a cold margarita,” Williams joked despite the sea sickness he’d endured for several hours. By 11:00 AM Soler approached Michael Feduccia, the slow-drawling captain of the catamaran out of Baton Rouge, to discuss Moseley’s progress — 7.6 miles in 7 hours, according to Feduccia’s estimate. “He should be covering at least two miles in an hour,” Soler said. “I think what you are asking me to do is to perform a miracle,” replied Feduccia, “but two GPS don’t lie.” Based on that pace (which would get slower as he tired), Moseley and Williams would be in the water for at least 24 hours. The plan needed to be reevaluated. Vieques, their destination, no longer seemed within reach. Umpierre, Soler, and Feduccia discussed options. Culebra Island, 13 miles away as opposed to Vieques which was now 17 miles away, had all along been plan “B,” but it was questionable now if Moseley could even make that. The current was making it ever-more difficult for progress. In an hour, Moseley had only covered 500 meters (more than four times slower than his usual pace). “It’s better to end a swim at another beach and be closer to Puerto Rico than to bail all together,” Umpierre said in advising everyone head to Culebra. By 1:00 PM the decision was made to head to Culebra. Despite disagreements among the crew, Soler insisted Moseley not be told of the change until close to shore to protect his mental outlook. Williams told Moseley to take the swim 40 degrees hard north, ostensibly to combat the currents. For the next four hours Moseley headed towards the south end of Culebra while tracking north of the islands due to the strong winds and submarine currents. Both Moseley and Williams were aware that the currents were working against them. 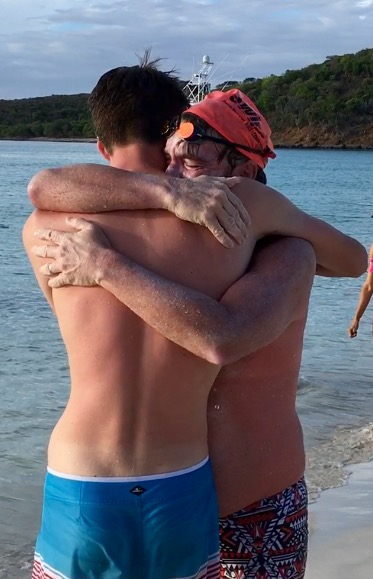 After 24.5 miles in rough water — further than the planned distance to Vieques — Moseley swam to shore with clear signs of physical wear. His body seemed puffy, his legs wobbly, and all over he was badly burned; his left shoulder was red and chaffed from the stubble of his chin brushing against it thousands of times as he turned to breathe. Behind him, the antagonistic currents and winds continued unabated, signs of what turned out to be the approach of Tropical Storm Don.